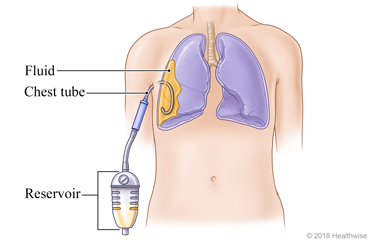 A chest tube is placed through the chest wall between two ribs. You may have had a chest tube put in to help your collapsed lung expand. Or the tube may have helped drain fluid from a chest infection or surgery. The tube was removed before you came home. You may have some pain in your chest from the cut (incision) where the tube was put in. For most people, the pain goes away after about 2 weeks. You will have a bandage taped over the wound. Your doctor will remove the bandage and examine the wound in about 2 days. It will take about 3 to 4 weeks for your incision to heal completely. It may leave a small scar that will fade with time. How soon you can return to work or your normal routine depends on what health problems you have. Talk with your doctor about how long it will take you to recover. You may shower after your bandage is removed. Pat the cut (incision) dry. Do not take a bath for 2 weeks after your chest tube is out, or until your doctor tells you it is okay. Practice deep breathing exercises as directed by your doctor. Coughing exercises also can help drain fluid out of your chest. If you take aspirin or some other blood thinner, be sure to talk to your doctor. He or she will tell you if and when to start taking this medicine again. Make sure that you understand exactly what your doctor wants you to do. Keep the incision dry as it heals. You will have a bandage over it to help the incision heal and protect it. Your doctor will tell you how to take care of this. Do not smoke. Smoking makes lung problems worse. If you need help quitting, talk to your doctor about stop-smoking programs and medicines. These can increase your chances of quitting for good. Your shortness of breath is getting worse. Bright red blood soaks through the bandage over your incision. Enter U748 in the search box to learn more about "Chest Tube Removal: What to Expect at Home".